This is a sponsored post. We received compensation in exchange for promoting these ideas about play, but all of the opinions and experiences are our own. The experts all agree that play is an important part of childhood development and our well-being as adults. 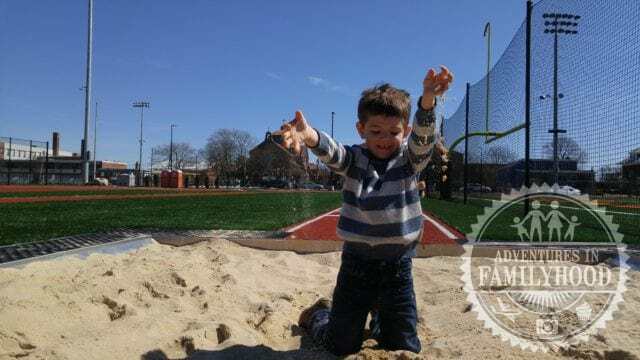 As one expert puts it, “play is our brain’s favorite way to learn.” Despite its benefits, playtime will unfortunately take a back seat to life’s other priorities. Here’s why play is important for both children and grown-ups, and 10 ways we can put more play into our day. My kids don’t play nearly as much as they should. I don’t play with my kids nearly as much as I should. 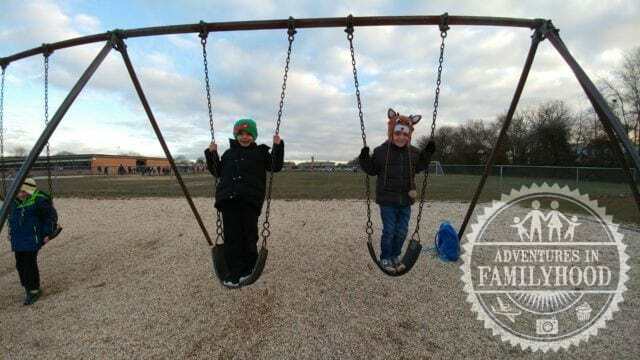 The playground is a great place to play with friends. Physical – Active play helps kids with coordination, balance, motor skills, and spending their natural energy. Social – Playing with others helps kids negotiate, collaborate, compromise, share, and much more. Cognitive – Children learn to think, read, remember, reason, and pay attention through play. Creative – By allowing imaginations to run wild during play, kids create new worlds, form unique ideas, and much more! Communication – Play lets kids exchange thoughts, information and messages. 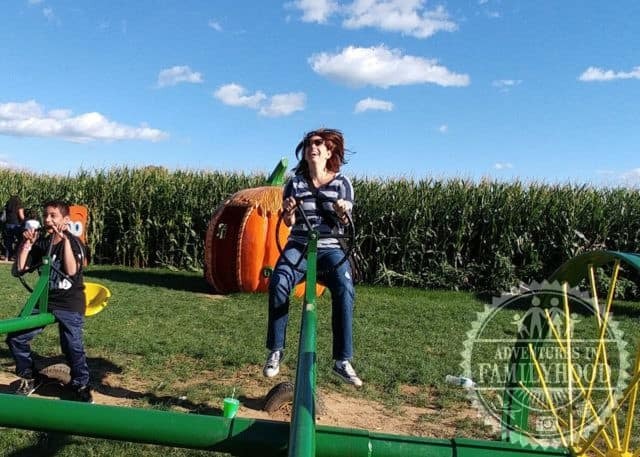 Lisa shows us that even adults can enjoy a see-saw! Stimulates the mind and boost creativity. Improves relationships and connection to others. Keeps you feeling young and energetic. I couldn’t agree with these more. It’s one of the reasons I love taking my family to Walt Disney World. I always return with more energy and creativity. With this in mind, I think you’ll all agree that we should find ways to play more throughout the day. Here are some ideas I’ve come up with. Jackson’s ready to show me a magic trick. 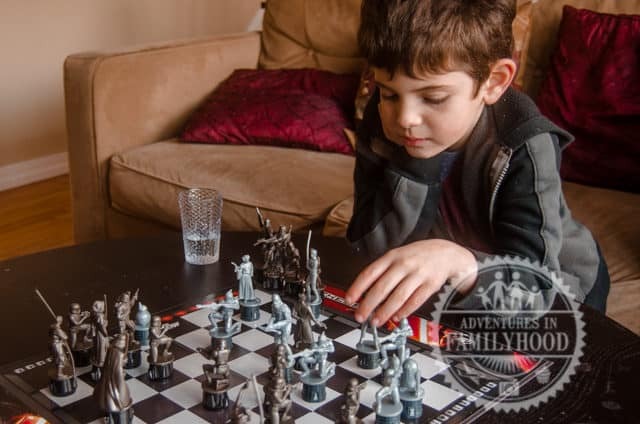 Family Game Night gets everyone in on the fun! 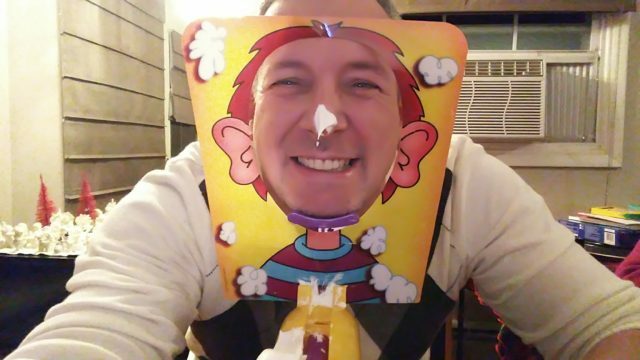 Here I am getting whip cream on my nose playing Pie Face. When something is important, we make time for it. So we should make time to play. I know that sounds strange, since we tend to think of play as spontaneous. But there’s no reason we can’t schedule play into our day. Plus, part of the fun is in the anticipation… so it’s always good to know it’s going to happen. 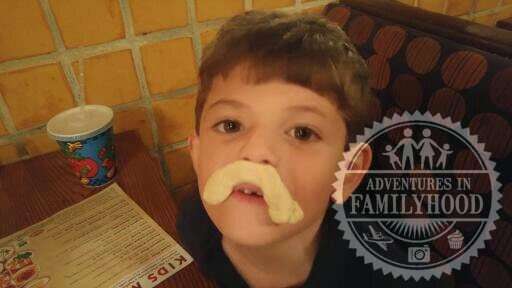 Jackson makes a mustache from dough at a local restaurant. I can’t say we’ve ever had any all-out food fights in our house, so I’ll stop short of recommending that here (but if you don’t mind cleaning up that mess, go for it!). There are plenty of ways to be playful when it comes to food, without resorting to throwing it across the room. Create themed meals like we do with our family movie nights. Make pizza and pancakes in unusual shapes. Eat the Rainbow (try to eat foods of all different colors). One of my favorite benefits to play is that you might learn something without even realizing it. It doesn’t matter if this is something being taught in school or knowledge that will be needed later in life. Just the act of learning and discovering something new while having fun will pay off for years to come. 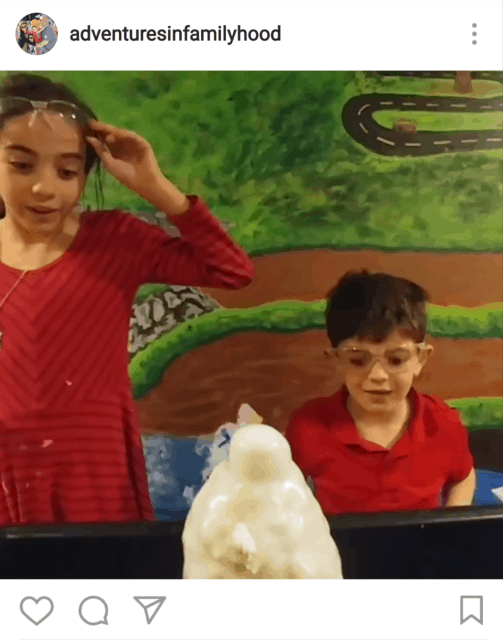 Do a science experiment like the one we did in the video! Use an app/site like Quizlet to help study. Reinforce what they learn in school with activities and field trips. Play trivia and strategy games to encourage critical thinking. Use your senses! Touch, Taste, Listen, Smell and See the world around you differently. Jackson asked me to bring out my Star Wars chess game that has been tucked away since I got it for Christmas. All you really need is your imagination to play, but having materials on hand does make it easier. Rotate toys in and out of storage to keep things fresh. Cardboard booths turned our playroom into a carnival! 7. Play a Little Bit at a Time. 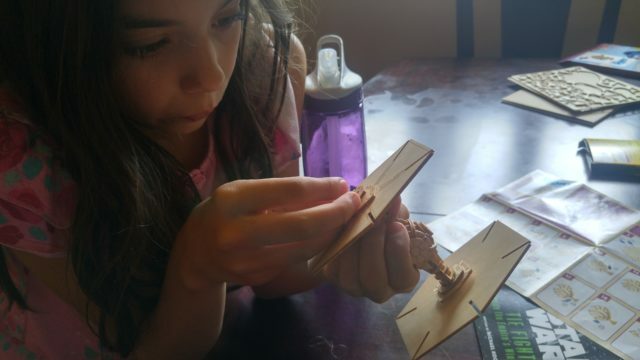 Bella putting together a 3D wooden TIE fighter. The project took several days to complete, when you include the time she spent painting it. One of the things that often stops us from doing an activity is not having enough time. What happens is we keep putting it off and putting it off because we don’t think we’ll have time for it. So, find something that you can do over time. 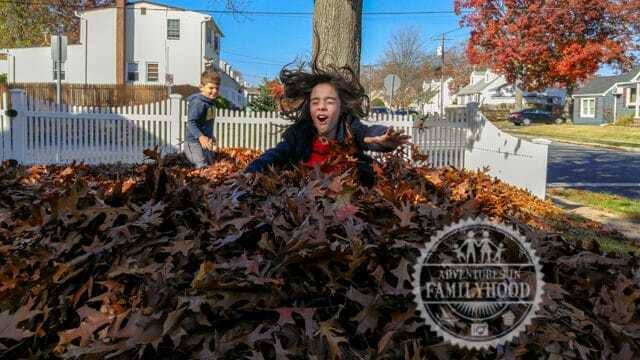 I can always convince the kids to help me rake the leaves, as long as we get to jump in the pile! As Mary Poppins famously sang, “a spoonful of sugar helps the medicine go down.” Adding an element of fun helps make even the most boring chore a bit more bearable. 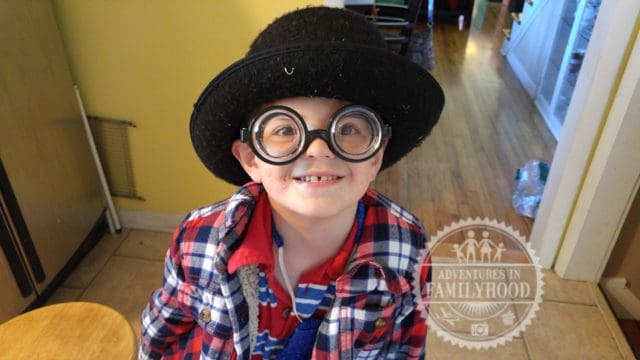 Role Play – dress up to clean! We live in an age of social media. Sometimes that is good, and sometimes it’s not. 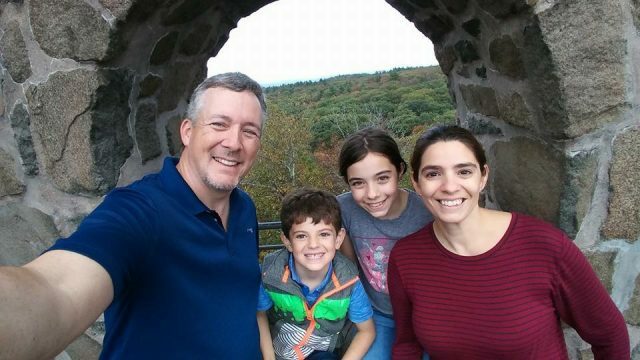 One of the good things about it is that we can easily connect with friends, family, and even people we don’t know over great distances. Laughter and play are things that we can all enjoy and relate to. Sharing our play through social media can not only give others enjoyment, but it can also enhance what we’re doing. Social sharing sites like Instagram, Facebook, and Pinterest are great places to get ideas for what and where to play next! We’ve started sharing some of our fun on YouTube too! We’re always searching for new ways to play, so let us know the ways you put some play into your day! We’d love to hear your ideas and try them for ourselves! I agree, we don’t play nearly enough. These are wonderful ideas! 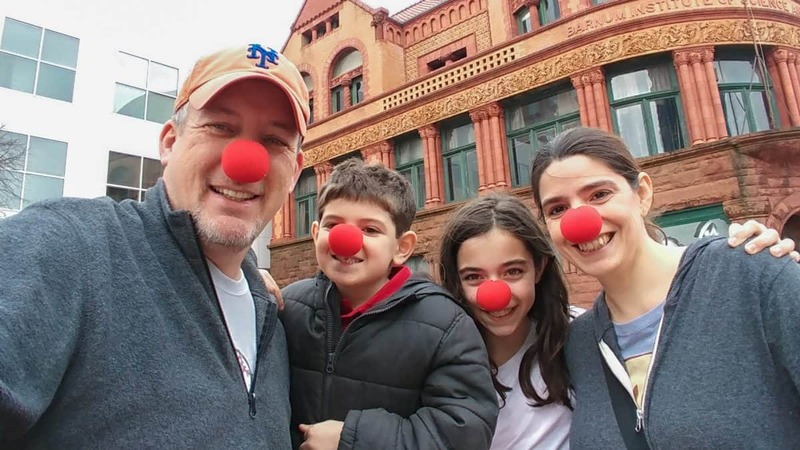 I admit, me and my kids definitely do not get outside to play enough. There are some great tips here, and we will definitely start setting aside some time and getting outside more! Great article. Couldn’t agree more. We all need more play time! What a great reminder for us all! At our house, our boys enjoy any type of “fight” or “war” with nerf guns, light sabers, pirate swords, etc. It involves lots of dress up too! Some of my favorites are cooking, crafts and experiments. We also have a lot of play revolving around sports- football, basketball and baseball! Thanks for this awesome list of new ideas for us to try!